In the United States, suburbanization began to occur in mass amounts after World War II, when soldiers returned home from war and wanted to live in houses outside of the city. During this time America had a prosperous postwar economy, there was more leisure time available and an increased priority in creating a family unit. Throughout the years, the desire to separate work life and home life has increased, causing an increase in suburban populations. Suburbs are built for particular groups of people and around certain industries like restaurants, shopping, and entertainment which allows suburban residents to travel less and interact more in the suburban area. Suburbs in the United States have also evolved by increases in technology, which allows residents to work from home rather than commute. Recent developments in communication technology, such as the spread of broadband services, the growth of e-mail and the advent of practical home video conferencing, have enabled more people to work from home rather than commuting. Although this can occur either in the city or in the suburbs, the effect is generally decentralizing, which works against the largest advantage of the centre city, which is easier access to information and supplies due to centralization. Similarly, the rise of efficient package expresses delivery systems, such as FedEx and UPS, which take advantage of computerization and the availability of an efficient air transportation system, also eliminates some of the advantages that were once to be had from having a business located in the city. Industrial, warehousing, and factory land uses have also moved to suburban areas. Cheap telecommunications remove the need for company headquarters to be within quick courier distance of the warehouses and ports. Urban areas suffer from traffic congestion, which creates costs in extra driver costs for the company which can be reduced if they were in a suburban area near a highway. As with residential, lower property taxes and low land prices encourage selling industrial land for profitable brownfield redevelopment. Suburban areas also offer more land to use as a buffer between industrial and residential and retail space to avoid NIMBY sentiments and gentrification pressure from the local community when residential and retail is adjacent to industrial space in an urban area. Suburban municipalities can offer tax breaks, specialized zoning, and regulatory incentives to attract industrial land users to their area, such as City of Industry, California. The overall effect of these developments is that businesses as well, and not just individuals, now see an advantage to locating in the suburbs, where the cost of buying land, renting space, and running their operations, is cheaper than in the city. This continuing dispersal from a single city center has led to other recent phenomena in American suburbs, the advent of edge cities and exurbs, arising out of clusters of office buildings built in suburban commercial centers on shopping malls and higher density developments. With more and more jobs for suburbanites being located in these areas rather than in the main city core that the suburbs grew out of, traffic patterns, which for decades centered on people commuting into the center city to work in the morning and then returning home in the evening, have become more complex, with the volume of intra-suburban traffic increasing tremendously. By 2000, half of the US population lived in suburban areas. In many countries of Europe, sometimes cities became seen as dangerous or very expensive areas to live, while the suburbs were seen as safe places to live and raise a family. There are periods of opposite developments like urbanization. During Communism, most socialist countries in the Eastern Bloc were characterized by under-urbanization, which meant that industrial growth occurred well in advance of urban growth and was sustained by rural-urban commuting. City growth, residential mobility, land and housing development were under tight political control. Consequently, sub-urbanization in post-communist Europe is not only a recent but also a particular phenomenon. The creation of housing and land markets and state withdrawal from housing provision have led to the development of privatized modes of housing production and consumption, with an increasing role for private actors and, particularly, for households. Yet, the regulatory and institutional frameworks indispensable to a market-driven housing system – including housing finance – have remained underdeveloped, particularly in south-eastern Europe. This environment has undoubtedly stimulated housing self-provision. Clearly, different forces have shaped different outcomes. Long-suppressed urbanization and a dramatic housing backlog resulted in extensive peri-urban growth in Tirana (Albania), which during the 1990s doubled the size of the city whereas war refugees put pressure on cities of former Yugoslavia. Elsewhere processes of suburbanization seemed dominant, but their pace differed according to housing shortages, available finance, preferences and the degree of 'permitted' informality. The process was slow in Prague during the 1990s and more apparent after 2000, when housing affordability improved. Conversely, Slovenian and Romanian suburban developments visibly surrounded cities/towns during the 1990s. Nonetheless, socialist legacies of underdeveloped infrastructure and the affordability crisis of transition differentiate post-socialist suburbs from their Western counterparts. Various degrees of informality characterized suburban housing from illegal occupation of public land (Tirana), illegal construction on agricultural private land (Belgrade) to the unauthorized but later legalized developments in Romania. Suburban housing displayed a chaotic/unplanned character, especially in south-eastern Europe, where the state retains a degree of illegitimacy. Excepting scattered for-profit housing, much of the new detached suburban houses seem self-developed. Allegedly, owner-building has become a household strategy to adapt to recession, high and volatile inflation, to cut construction costs and, finally, to bridge access to housing. The predominantly owner-built feature of most suburban housing, with the land often obtained at no cost through restitution policies or illegal occupation, allowed a mix of low-/middle-income households within these developments. Tijuana has experienced a strong wave of suburbanization from its urban core beginning in 2006. Historically, Tijuana city, with 1/4 the area covering 80 square miles, contained well over 95% of the total population of the municipality, and it was the poor relegated to living outside the city. Despite good highways, however, there was little incentive to move out of the city. However, with a huge escalation of the Mexico drug war violence, middle class city residents and property developers along with retail chains began building suburban communities and sold them as a way to isolate themselves and their children from the negative effects. This led to a historic movement to communities outside the urban core, as evidenced by both the type of middle class housing developments and 2010 INEGI census figures. Historically, it was believed that living in highly urban areas resulted in social isolation, disorganization, and psychological problems, while living in the suburbs was supposed to be better to overall happiness, due to lower population density, lower crime, and a more stable population. A study based on data from 1974, however, found this not to be the case, finding that people living in the suburbs had neither greater satisfaction with their neighborhood nor greater satisfaction with the quality of their lives as compared to people living in urban areas. Pre-existing disparities in the demographic composition of suburbs pose problems in drug consumption and abuse. This is due to the disconnection created between drug addiction and the biased outward perception of suburban health and safety. The difference in drug mortality rates of suburban and urban spaces is sometimes fueled by the relationship between the general public, medical practitioners, and the pharmaceutical industry. These affluent individuals, who are living in the suburbs often have an increased means of obtaining otherwise expensive and potent drugs such as opioids and narcotics through valid prescriptions. In the United States, the combination of demographic and economic features created as a result of suburbanization has increased the risk of drug abuse in suburban communities. Heroin in suburban communities has increased in incidence as new heroin users in the United States are predominantly white, suburban men and women in their early twenties. Adolescents and young adults are at an increased risk of drug abuse in suburban spaces due to the enclosed social and economic enclaves that surburbanization propagates. The New England Study of Suburban Youth found that the upper middle class suburban cohorts displayed an increased drug use when compared to the natural average. The shift in demographics and economic statuses caused by suburbanization has increased the risk of drug abuse in affluent American communities and changed the approach to drug abuse public health initiatives. When addressing public health concerns of drug abuse with patients directly, suburban health care providers and medical practitioners have the advantage of treating a demographic of drug abuse patients that are better educated and equipped with resources to recover from addiction and overdose. The disparity of treatment and initiatives between suburban and urban environments in regard to drug abuse and overdose is a public health concern. Although suburban healthcare providers may have more resources to address drug addiction, abuse, and overdose, preconceived ideas about suburban lifestyles may prevent them from giving proper treatment to patients. Considering the increasing incidence of drug abuse in suburban environments, the contextual factors that affect certain demographics must also be considered to better understand the prevalence of drug abuse in suburbs; for example, adolescents and their relationship with social groups in school and other socializing forces that occur as a result of suburbanization impact drug abuse incidence. The economic impacts of suburbanization have become very evident since the trend began in the 1950s. Changes in infrastructure, industry, real estate development costs, fiscal policies, and diversity of cities have been easily apparent, as "making it to the suburbs", mainly in order to own a home and escape the chaos of urban centers, have become the goals of many American citizens. These impacts have many benefits as well as side effects and are becoming increasingly important in the planning and revitalization of modern cities. 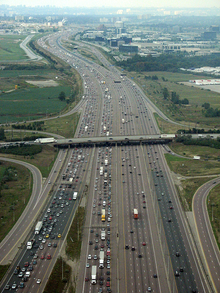 Sprawling Freeway near Toronto, Canada with a suburbanized industry area in the background. Note the far distances from office buildings compared to a downtown. Many office buildings in suburban industry areas are set up on large irrigated campus, versus downtowns that have close buildings and very little greenery. The days of industry dominating the urban cores of cities are diminishing as population decentralization of urban centers increases. Companies increasingly look to build industrial parks in less populated areas, largely for more modern buildings and ample parking, as well as to appease the popular desire to work in less congested areas. Government economic policies that provide incentives for companies to build new structures and lack of incentives to build on Brownfield land also contribute to the flight of industrial development from major cities to surrounding suburban areas. As suburban industrial development becomes increasingly more profitable, it becomes less financially attractive to build in high-density areas. Another impact of industry leaving the city is the reduction of buffer zones separating metropolitan areas, industrial parks and surrounding suburban residential areas. As this land becomes more economically relevant, the value of such properties very often increases, causing many undeveloped landowners to sell their land. As America continues to sprawl, the cost of the required water lines, sewer lines, and roads could cost more than $21,000 per residential and non-residential development unit, costing the American government $1.12 trillion over the next twenty five years. Along with the costs of infrastructure, existing infrastructure suffers, as most of the government's money that is dedicated to improving infrastructure goes to paying for the new necessities in areas further out from the urban core. As a result, the government will often forgo maintenance on previously built infrastructure. For residential properties, suburbanization allows for home prices to decrease, so people can drive until they can find an area in which they can afford to buy a home. However, these homes may lack certain things such as parks and access to public transit. Also, the prices of homes in downtown center usually decrease as well to compete with the inexpensive homes in the suburbs. One of the main benefits of living in the suburbs is that one gets a much larger piece of land than one would in the city. Therefore, as the size of lots increases, the supply of housing is more limited. This is to mean that as city growth patterns increase the population increases leading to suburbanisation which hence leads to the under development of real estate since it is a business. With the growth of suburbanization and the spread of people living outside the city this can cause negative impacts on the environment. Suburbanization has been linked to the increase in vehicle mileage, increase land use, and increase in residential energy consumption. From these factors of suburbanization, it has then caused a degradation of air quality, increase usage of natural resources like water and oil, as well as increased amounts of greenhouse gas. With the increased use of vehicles to commute to and from the work place this causes increased use of oil and gas as well as an increase in emissions. With the increase in emissions from vehicles, this then can cause air pollution and degrades the air quality of an area. Suburbanization is growing which causes an increase in housing development which causes an increase in land consumption and available land. Suburbanization has also been linked to increase in natural resource use like water to meet residents' demands and to maintain suburban lawns. Also, with the increase in technology and consumptions of residents there is an increase in energy consumption by the amount of electricity used by residents. Suburbanization has negative social impacts on many groups of people, including children, adolescents, and the elderly. Children who are affected by suburbanization, or urban sprawl, are commonly referred to as "cul-de-sac kids." Because children living in a suburb cannot go anywhere without a parent, they are unable to practice being independent. Teenagers that are unable to be independent experience a lot of boredom, isolation, and frustration. These feelings have even led to an increase in rates of teenage suicide and school shootings in suburban areas. Despite these issues with young people, suburbia was still intended for young families. The elderly in suburbia experience social isolation once they lose their license to drive. In order to leave their home the elderly need to be able to afford a chauffeur or be willing to ask relatives to drive them around. This has resulted in upper-class elderly moving to retirement communities. Both the wealthy elderly and those who still live in suburbs are largely separated from all other groups of society. ^ "Slow Growth and Urban Sprawl: Support for a New Regional Agenda?," Juliet F. Gainsborough, Urban Affairs Review, vol. 37, no. 5 (2002): 728-744. ^ Benson, Sonia, ed. (2009). "Suburbanization". UXL Encyclopedia of U.S History. pp. 1498–1501. ^ Murray, P.; Szelenyi, I. (1984). "The city in the transition to socialism". International Journal of Urban and Regional Research. 8 (10): 90–107. doi:10.1111/j.1468-2427.1984.tb00415.x. ^ a b c Soaita, A. M. (2013). "Romanian suburban housing: home improvement through owner-building" (PDF). Urban Studies. 50 (10): 2084–2101. doi:10.1177/0042098012471980. ^ Hirt, S.; Petrovic, M. (2011). "The Belgrade wall: The proliferation of gated housing in the Serbian capital after socialism". International Journal of Urban and Regional Research. 35 (4): 753–777. doi:10.1111/j.1468-2427.2011.01056.x. ^ Kahrik, A.; Tammaru, T. (2008). "Population composition in new suburban settlements of the Tallinn metropolitan area". Urban Studies. 45 (5/6): 1055–1078. doi:10.1177/0042098008089853. ^ Krisjane, Z.; Berzins, M. (2012). "Post-socialist Urban Trends: New Patterns and Motivations for Migration in the Suburban Areas of Rīga, Latvia". Urban Studies. 49 (2): 289–306. doi:10.1177/0042098011402232. ^ Adams, Richard E. (1992). "Is happiness a home in the suburbs? : The influence of urban versus suburban neighborhoods on psychological health". Journal of Community Psychology. 20 (4): 353–372. doi:10.1002/1520-6629(199210)20:4<353::aid-jcop2290200409>3.0.co;2-z. Archived from the original on 2013-01-05. ^ "The Suburbs That Are Sicker Than They Look". CityLab. Retrieved 2018-03-27. ^ "Rates of Drug Use: Urban, Suburban, & Rural | Sunrise House". Sunrise House. Retrieved 2018-03-27. ^ "New Face of Heroin Is Young, White and Suburban, Study Finds". NBC News. Retrieved 2018-03-27. ^ Luthar, Suniya S.; Small, Phillip J.; Ciciolla, Lucia (February 2018). "Adolescents from upper middle class communities: Substance misuse and addiction across early adulthood". Development and Psychopathology. 30 (1): 315–335. doi:10.1017/S0954579417000645. ISSN 1469-2198. PMID 28558858. ^ "The increase in heroin users coming to the hospital reflects current trends in drug abuse". Modern Healthcare. Retrieved 2018-03-27. ^ "The increase in heroin users coming to the hospital reflects current trends in drug abuse". Modern Healthcare. Retrieved 2018-04-05. ^ LUTHAR, SUNIYA S.; D'AVANZO, KAREN (1999). "Contextual factors in substance use: A study of suburban and inner-city adolescents". Development and Psychopathology. 11 (4): 845–867. PMC 3535189. PMID 10624729. ^ Opp, Susan M.; Herberle, Lauren (June 28, 2008). Local Sustainable Urban Development in a Globalized World. Florence, Kentucky: Routledge. ISBN 978-0754649946. ^ Soule, David (2006). Urban Sprawl: A Comprehensive Reference Guide. London: Greenwood Press. pp. 88–89. ^ Anthony Downs; Barbara McCann; Sahan Mukherji; Robert Burchell (2005). Sprawl Costs: Economic Impacts of Unchecked Development. Island Press. p. 63. ^ Anthony Downs; Barbara McCann; Sahan Mukherji; Robert Burchell (2005). Sprawl Costs: Economic Impacts of Unchecked Development. Island Press. pp. 71–72. ^ Anthony Downs; Barbara McCann; Sahan Mukherji; Robert Burchell (2005). Sprawl Costs: Economic Impacts of Unchecked Development. Island Press. pp. 80–81. ^ Boustan, Leah Platt; Margo, Robert A. (2013). "A Silver Lining to White Flight? White Suburbanization and African-American Homeownership, 1940–1980". Journal of Urban Economics. 78: 71–80. doi:10.1016/j.jue.2013.08.001. ^ Kahn, Matthew E (2000). "The Environmental Impact of Suburbanization". Journal of Policy Analysis and Management. 19 (4): 569–586. doi:10.1002/1520-6688(200023)19:4<569::aid-pam3>3.3.co;2-g.
^ "Long commutes to Vancouver colleges lead to brain drain as students leave | CBC News". ^ Andres, Duany (2010-09-14). Suburban nation : the rise of sprawl and the decline of the American Dream. Plater-Zyberk, Elizabeth, Speck, Jeff (10th anniversary ed.). New York. ISBN 9780865477506. OCLC 555656296. Burchell, Downs, McCann, Mukherji. (2005) "Sprawl Costs: Economic Impacts of Unchecked Development" London, Island Press. Wiese, Andrew. (2005) Places of Their Own: African American Suburbanization in the Twentieth Century Chicago, University of Chicago Press. Soule, David. (2006) "Urban Sprawl: A Comprehensive Reference Guide" London, Greenwood Press. ^ Massey, Douglas S.; Denton, Nancy A. (1988). "Suburbanization and Segregation in US Metropolitan Areas". American Journal of Sociology. 94.3. ^ McIntosh, Peggy (1988). White Privilege and Male Privilege: A Personal Account of Coming to See Correspondences through Work in Women's Studies. Wellesley, MA: Center for Research on Women. ^ Mieszkowski, Peter; Mills, Edwin S. (1993). "The Causes of Metropolitan Suburbanization". Journal of Economic Perspectives. 7.3 (3): 135–47. doi:10.1257/jep.7.3.135. ^ Pulido, Laura (March 2000). "Rethinking Environmental Racism: White Privilege and Urban Development in Southern California" (PDF). Department of Geography at the University of Southern California. ^ Oliveira, N. Dos Santos (1996). "Favelas and Ghettos: Race and Class in Rio De Janeiro and New York City". Latin American Perspectives. 23.4 (4): 71–89. doi:10.1177/0094582x9602300406.